“Americana – Canadian style!” is how this band likes to describe their brand of music. After 3 years as indie rockers, the members of the former Kinnexa Cross band were at a crossroads; they had won or been finalists in a number of rock competitions, sold about 500 copies of the first CD, and played everywhere they could, but they were working insanely hard and going nowhere. Plus ongoing lineup changes, particularly with drummers and regular criticism for their high energy – but high volume – show were killing their ability to grow and attract a larger fanbase. But, when life gives you lemons… well, this band really did make lemonade; with the departure of their previous lead guitarist, Mark Paré (formerly on rhythm) stepped up to lead and brought his own uniquely spare, rootsy, rhythmic sound to the band’s guitar-driven music. The band found themselves pulled in a new direction towards a less aggressive sound and towards original music that had wide appeal and was perfectly suited to Kinnexa’s vocal style. 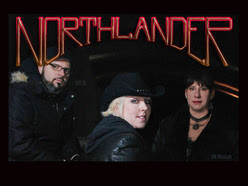 With the style and sound change, came a name and brand change as well, and out of the ashes of the KC band, “Northlander” was born. Since April 2011, Northlander has recorded and released an EP “Turnaround”, rearranged their original music, played everywhere they could, quadrupled their online fanbase and rocketed up the Reverbnation charts to #1 nationally in Americana. Two of their songs have been in regular rotation on VRadio (Las Vegas), as well as several other internet radio stations. Looks like this band has found the right niche after all. If You Like Northlander's Music, Please Buy It ! !